An atomic force microscope (AFM) is a high-resolution, scanning microscope capable of imaging and measuring samples on the nanometer to angstrom scale. A fine probe on a cantilever is used to scan the surface of a specimen. Forces generated as the tip of the probe interacts with the surface are recorded as deflections on the cantilever. Using a wide variety of scanning modes and tip designs many different properties of a specimen can be examined including; 3-dimensional mapping of topography, phase imaging, mechanical, magnetic and electrical properties. The current AFM is a NT-MDT NTEGRA , a high-resolution, low-noise scanning probe microscope with integrated analysis software for a range of AFM applications. In addition, a Hysitron Triboscope nano-indenter interfaces with the AFM for the measurement of mechanical properties. 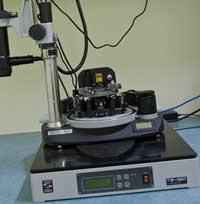 Measurement of mechanical properties such as hardness, elastic modulus, fracture toughness, ramped and constant force scratch resistance, friction coefficient, wear, and thin film interfacial adhesion. The maximum scan height for the AFM is 10 µm, therefore a sample must be very flat – at least within the desired scanning region – before it can be imaged. Ideally, samples will be no greater than 1 x 1 x 1 cm3, however it is in theory possible to image samples larger than this. Samples intended for analysis via the TriboScope® NanoIndenter must be fastened onto a steel substrate using a thin, even layer of super glue, and will be no larger than 1 cm in height, breadth or depth.